Bulletin 1738 ArmorPOINT I/O adds enhanced environmental characteristics to the proven POINT I/O architecture, extending the benefits of modular designs and plug-and-play electronic capabilities to your on-machine applications. 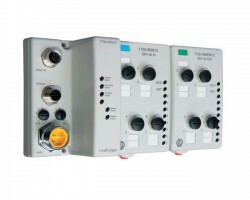 Compatible with EtherNet/IP, ControlNet, DeviceNet, and other networks. DeviceLogix Smart Component Technology on DeviceNet modules and embedded switch technology on EtherNet/IP modules provide advanced features and increased performance from your I/O components.